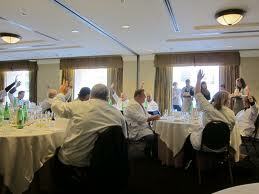 The San Francisco World Spirits Competition held its esteemed judging on March 22nd, 23rd, 24th, and 25th, at the Hotel Nikko in downtown San Francisco. With continued growth in its 12th year 1,215 premium spirits were submitted from 60 countries, making it another record-breaking year, up 10% over last year. The San Francisco competition is the oldest and largest spirit competition in the United States and the most recognized in the world. 149 Double Gold Medals were awarded, 209 Gold Medals, 444 Silver Medals, and 258 Bronze Medals. The largest increase in submissions was from tequila producers, up 33% from last year, while mezcal submissions were up 22%. Bourbon was up 25%, rum 15%, and rhum agricole, pisco, and single malt scotch entries all had significant gains, reflecting current industry trends. Anthony Dias Blue, The San Francisco World Spirits Competition’s Founder and Executive Director, began the judging on Thursday to devote three days of judging 82 classification categories of spirits. Sunday was devoted entirely to the tasting of those spirits that had been awarded a Sweeps Double Gold and had been selected for inclusion in the Sweepstakes Round. Thirty-three distinguished spirits professionals from across the United States were assembled to judge these premium spirits. Tony Abou-Ganim, the “Modern Mixologist”, and the competition’s Director of Judging said, “This competition brings together some of the finest spirits palates working in the industry today. I feel honored that I could once again be a part of this wonderful event.” This group of industry leaders is directly responsible for purchasing over $100,000,000 worth of spirits each year while the journalist members reach more than a million trade and consumer readers each month. Taking top honors, The Tasting Panel Magazine “Distiller of the Year” went to Burn Stewart Distillers of Glasgow, Scotland, a scotch whiskey producer, and “Importer of the Year” went to Beam Inc., out of Illinois. This year Mr. Blue gave the “Director’s Award” to William Grant & Sons out of New York for excellence and consistency of its quality products. “Best in Show – Unaged White Spirit” (and “Best Silver Tequila”) was claimed by Avion Silver Tequila from Mexico ($40) and is imported by Avion Spirits, LLC of New York, while “Best in Show – Aged White Spirit” (and “Best Aged Rum”) went to Vizcaya VXOP Cask 21 Year Solera Rum from the Dominican Republic ($38). “Best in Show – Whiskey” (and “Best Single Malt Scotch”) was awarded to Isle of Jura’s Single Malt Scotch 1976, ($750), imported by Whyte & Mackay Americas. Boulard Calvados XO (“Best Calvados”) captured the overall “Best in Show – Brandy” award ($110) and is imported by Palm Bay International, of Port Washington, New York. The “Best in Show Liqueur” (and “Best Fruit Liqueur”) was given to Grand Marnier’s Quintessence Orange Liqueur, ($799), from Cognac, France. In addition to the premium awards, the top ranking spirit in each category was awarded a “Best” title. In the White Spirits other category winners included “Best Vodka” won by Platinka’s Original Vodka from Belarus ($25); “Best Flavored Vodka” went to EFFEN® Cucumber Vodka from Holland and imported by Beam Inc. ($30); “Best Aquavit” went to Krogstad Aquavit, of Oregon ($25). “Best Gin” was awarded to Tanqueray for its London Dry Gin, United Kingdom ($20); “Best White Rum” went to Kinkylux for its White Rum from ASM Liquor in Trinidad & Tobago ($18); “Best Gold Rum” went to Cockspur’s Fine Rum, Barbados ($30); “Best Rhum Agricole” was awarded to Rhum J.M. for its Rhum Agricole Millesime 2001 ($120); “Best Cachaca” was given to Leblon Maison Leblon Cachaca Reserve Especial, Minas Gerais, Brazil ($30); and “Best Mezcal” went to Real Matlatl Mezcal Tobala, Oaxaca, Mexico ($125). Best in the Tequila section were “Best Reposado Tequila” to Alquimia Organic Reposado Tequila, Los Altos de Jalisco, Mexico ($54), imported by Tierra Madre from Oxnard, California; “Best Anejo Tequila” was Don Celso Anejo Tequila from San Nicolas S.H., Jalisco, Mexico ($47) and imported by Integras Design, San Jose, California; while “Ultra-Aged Anejo Tequila” was given to El Tesoro Extra-Aged Anejo Tequila Paradiso, Jalisco, Mexico ($110). The Whisky and Whiskies categories included Old Forester Birthday Bourbon 2011 winning the “Best Bourbon” category, from Brown-Forman Distillery, Kentucky, ($50); “Best Rye” went to Knob Creek Rye, Kentucky ($40); “Best Canadian Whiskey” was Canadian Mist Black Diamond Canadian Whisky, imported by Brown-Forman of Louisville, KY ($15); “Best Irish Whiskey” was Bushmills 21 Year Old Single Malt Irish Whiskey, Ireland ($125), imported by Diageo North America of Norwalk, CT; “Best Blended Scotch” went to Whyte & Mackay Supreme 30 Year Old Scotch ($290), Scotland; Suntory Yamazaki 18 Year Old Single Malt Whisky was awarded “Best Other Whisky,” Yamazaki, Japan ($120). Under the Brandy group the “Best Armagnac” was won by Comte de Lauvia Armagnac VSOP Superior, France ($49), imported by House of Burgundy, New York; “Best Cognac” went to Hennessy Cognac Richard Hennessy, France ($3500), imported by Moet Hennessy USA, New York; and “Best Pisco” went to Waqar Pisco, Chile ($45). The top Liqueurs and Other Spirits awards included “Best Cream Liqueur” won by Mozart Gold – Chocolate Cream Liqueur, from Austria ($28); and “Best Aperitif “was awarded to Aperol Aperitif, from Italy ($22), and imported by Palm Bay Int’l, Syosset, New York. The San Francisco World Spirits Competition also held its annual Packaging Competition at the Hotel Nikko on Friday, March 23rd. Four judges considered the bottle designs and packaging appeal of 165 entries. Clare Kuo of Clare Kuo design, Jim Moon of Jim Moon Design, Joel Blum, the Competition’s in-house graphic designer, and Kevin Shaw of Stranger & Stranger awarded 31 outstanding packaging designs. Eleven Double Gold Packaging Awards were given: G&J Greenall for BLOOM Premium London Dry Gin, London, England; Marnier Lapostolle, LLC won for Kappa Pisco, Chile, designed by Ora-Ito; Wylie Howell Spirits LLC for Wylie Howell Corn Whiskey, California; and Sammy’s Beach Bar Rum, Maui. Kah picked up individual Double Gold awards for its “skull” Blanco, Reposado, and Anejo Tequila as well as a Double Gold for the series designed by Sandra Lugo, Mexico. The Double Gold WOW Factor award went to: Design Lab LLC for its Manhattan bottle designed by Linda Rechnagel Anderson, Reno, Nevada; to SPOTLYTE Organic Vodka by Simon T. Enterprises, France; and to International Premium Spirits for the Dos Armadillos Tequila, Mexico. Additional results and photos of Double Gold Packaging winners and WOW Factor awards can be found at www.sfspiritscomp.com. Pictures of the competition will be available at http://j412.smugmug.com/Clients/SFWSC-2012/22040286_Q9r4Hn/. 2012 San Francisco World Spirits Competition judges included: Anthony Dias Blue – Executive Director San Francisco World Spirits Competition and San Francisco International Wine Competition, President, Blue Lifestyle, Editor-in-Chief, The Tasting Panel Magazine, Los Angeles; Director of Judging San Francisco World Spirits Competition –Tony Abou-Ganim – Master Mixologist, The Modern Mixologist, Las Vegas; Bridget Albert – Mixologist, Southern Wine & Spirits, Chicago; Stephen Beal – Keeper of the Quaich, Senior Master of Whisky, Consultant and Educator, San Francisco; Kent Bearden – CSS, Master Mixologist, Regional Sales Manager, Casa Dragones Tequila Company, Las Vegas; Julio Bermejo – Tequila Master/Spirits Buyer, Tommy’s Mexican Restaurant, San Francisco; Mark Bowery – Wine & Spirits Consultant, Mark Bowery Consulting, Mendocino; Derek Brown – Co-owner / Mixologist, The Passenger and Columbia Room, Washington, D.C.; Jerry Cooper – Proprietor, Swirl on Castro, San Francisco; Aidan Demarest – Beverage Manager, Spare Room, Hollywood Roosevelt Hotel, Los Angeles; H. Joseph Ehrmann – Proprietor, Elixir, San Francisco; Ziggy Eschliman – The Wine Gal and Countess of Cocktails, Wine Country Radio, Santa Rosa; Michael Feil – GM / Wine & Spirits Buyer, Westchester Country Club, Rye; David Grapshi – Tequila National Sales Manager, Sazerac / Gemini, Walnut Creek; Thomas “Mac” Gregory – Director of Food & Beverage, Starwood Hotels – Franchise for North America Division, Scottsdale; Kim Haasarud – Founder, Liquid Architecture, Phoenix; Richard Carleton Hacker – Spirits Journalist, Robb Report; The Tasting Panel Magazine, Los Angeles; Steven Izzo – Beverage Director, Waterbar, San Francisco; Geoff Kleinman – Editor, DrinkSpirits.com, Portland; Francesco Lafranconi – Southern Wine & Spirits, National Director of Mixology and Spirits Education, Las Vegas; Drew Levinson – Beverage Development, Wirtz Beverage Nevada, Las Vegas; Jordan Mackay -Wine & Spirits Editor, 7×7 Magazine, San Francisco; David Mahoney – Wine & Spirits Writer, Minneapolis; Meridith May – Publisher & Executive Editor, The Tasting Panel Magazine, Los Angeles; Tim McDonald – President, Wine Spoken Here, Napa; Jeffrey Morgenthaler – Bar Manager/Founder, Clyde Common/RepealDay.org, Portland; Nick Passmore – Artisanal Editor, Four Seasons Magazine; Wine Columnist, Bloomberg Businessweek; Robert Plotkin, Author, Trade Writer, Beverage Consultant, BarMedia, Tucson; Patricia Richards, Proprietor & CEO, Bar Chef Biz, Inc., Las Vegas; Jim Romdall – Manager and Mixologist, Vessel, Seattle; Audrey Saunders – Co-owner / Mixologist, Le Pegu Club, New York; Trudy Thomas – Director of Beverage, JW Marriott Camelback Inn, Scottsdale; Kevin M. Vogt, MS – Wine & Spirits Director, Emeril’s Restaurants, Las Vegas.